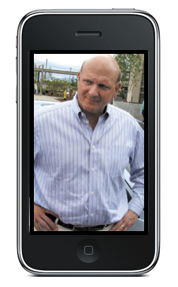 This weekend a story was circulating around the net about Steve Ballmer lambasting an employee for taking his picture with an iPhone. Ballmer is, of course, the CEO of Microsoft, Apple's biggest competitor. And, the photo was snapped at a private meeting for Microsoft employees. The comments flying back and forth on this topic range from people arguing which company is better, Microsoft or Apple, to people berating Ballmer's antics. However, I find it odd that very few people seem to question the lack of common sense this employee displayed. Employee X brings a competitor's product into a staff meeting meant to pump up employees and uses that product to take a picture of the CEO? Are you kidding me? Who in their right mind would do that? Especially considering we're talking about Apple and Microsoft here. That would be the equivalent of a General Motors employee picking up the CEO in a BMW. Really, am I missing something on this one? Nope, you got it right. Both employee and CEO acted equally unprofessionally.